To view our current inventory of antique and vintage sexants, click here! 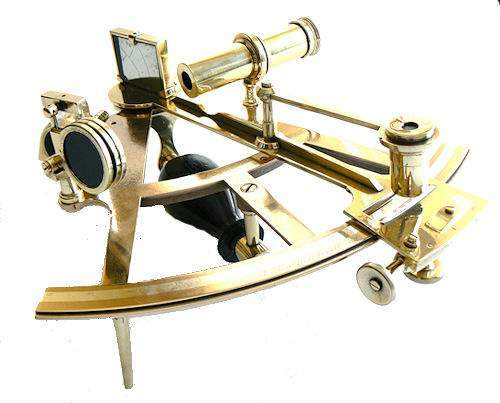 Presented is “T frame” brass frame antique sextant with platinum arc, now about 130 years old. The signature on the lower arc is difficult to read, but we interpret it as “L. Van Der Feedl, Antwerp. Our research can not pin down the maker. The city of Antwerp is in Belgium, and has a strong Dutch influence. Based in its design we date it as having been made in the last quarter if the 19th Century. It come housed in a beautifully made fan shaped Mahogany case with a rich patina of age. It has some age cracks, but is strong and sturdy. 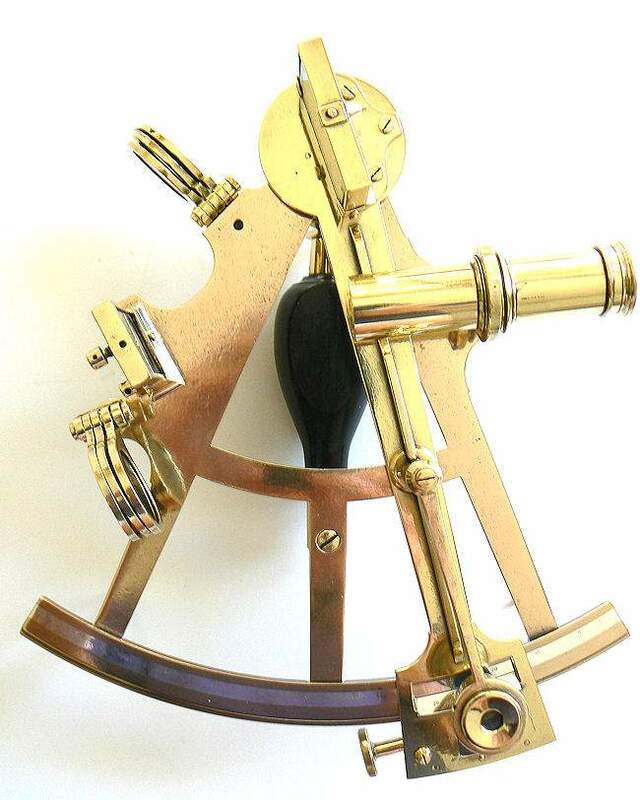 THE INSTRUMENT: This beautifully made sextant has a ribbed brass index arm measures 9 5/8 inches long. Note the thumb screw on the endless tangent screw, swing arm magnifier, early form platinum vernier scale, reading from right to left from 0 to 20 arc minutes, a removable sighting tube, and two sets of sun shades, three for the index mirror and three for the horizon mirror. The handle is made from Ebony which with the other indicators all of which help date the instrument as from the last quarter of 19th Century. 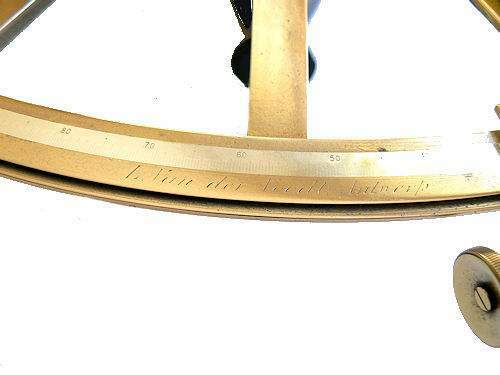 INSTRUMENT CONDITION: The sextant has been recently polished and lacquered. The two mirrors are in much better shape than would be expected and only have a few small dark spots with little loss of silvering. age. The arc's engraving of degrees is sharp and distinct. The index arm clamp and tangent screw are complete. The shade glasses are complete. Everything is in good working order. The entire instrument shows as complete except that the telescope is missing. The instrument has its original machinery, and a sighting tube, plus an adjustment pick and two telescope shade caps one of which is mounted. 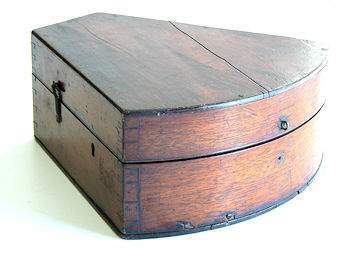 THE CASE: The "keystone" or "fan" shaped case is made from Mahogany, and except for a couple of age cracks is in excellent condition for its age and use at sea. There is no label and one hook is missing in the front. the better known English makes, and will make a perfect gift. 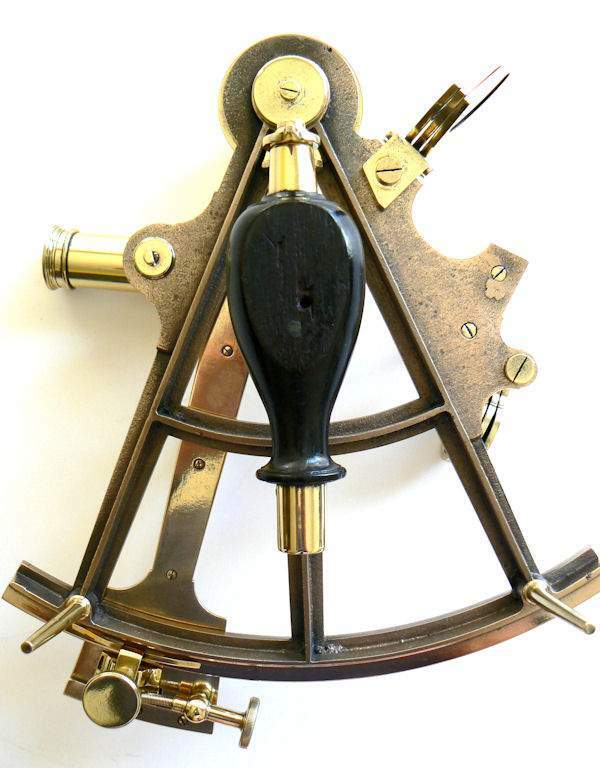 Width of frame at arc 8 1/2"
QUALIFICATIONS: We are one of the few company's still selling navigation instruments that know anything about them. For purposes of judging whether Joel's opinion counts, he was the editor of the chapter on sextants of the 1977 Edition of "Bowditch", The American Practical Navigator, NAVPUB 9; a member of the U.S. Naval Academy Navigation Symposium Board, 1975 -1978; the author of a book on marine sextants, Cornell Maritime Press,1975, and the founding president of Nautech Maritime Corporation which partnered with Tamaya of Japan in the introduction of the MS 733 Spica, the MS 833, Jupiter, MS 933 Venus sextants and the famous NC-2 navigation computer, in the U.S. market. Joel is a retired Master Mariner, and held a U.S. Navy "D" Qualification as a Senior Skipper - Oceans. From 1995 until 2001, he was a Varsity Offshore Sailing Team Coach at the U.S. Naval Academy. OUR UNCONDITIONAL NO NONSENSE GUARANTEE: If not completely satisfied with your purchase it may be returned, if without damage, within five days of receipt in its original packaging. Return items must be insured for their full value. Only a prior email authorization by us for the return is required. Shipping charges are included in this offer if the error is due to our fault. International buyers welcome, but must inquire first. We have satisfied customers in Argentina, Australia, Austria, Belgium, Bermuda, British Virgin Islands, Canada, Chile, China, Czech Republic, Democratic Republic of Congo, Denmark, Estonia, England, France, Germany, Greece, Holland, Hong Kong, Hungary, Iceland, Indonesia, Ireland, Israel, Italy, Japan, Kuwait, Latvia, Luxembourg, Martinique, Mexico, New Zealand, Nigeria, Norway, Nova Scotia, Panama, Poland, Portugal, Puerto Rico, Romania, Saudi Arabia, Scotland, Singapore, Spain, Sweden, Switzerland, Thailand, Turkey, United Arab Emirates, USVI and the Eastern Caribbean. 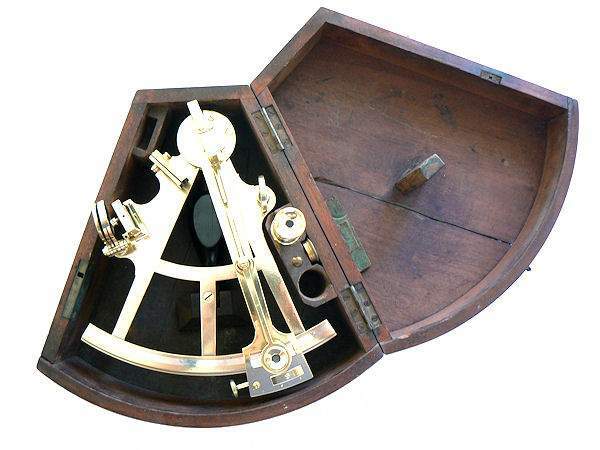 Presented is “T frame” brass frame antique sextant with platinum arc, now about 130 years old. The signature on the lower arc is difficult to read, but we interpret it as “L. Van Der Feedl, Antwerp. Our research can not pin down the maker. The city of Antwerp is in Belgium, and has a strong Dutch influence. Based on its design we date it as having been made in the last quarter if the 19th Century. It come housed in a beautifully made fan shaped Mahogany case with a rich patina of age. It has some age cracks, but is strong and sturdy. 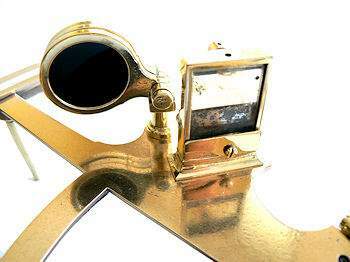 THE INSTRUMENT: This beautifully made sextant has a ribbed brass index arm measuring 9 5/8 inches long. 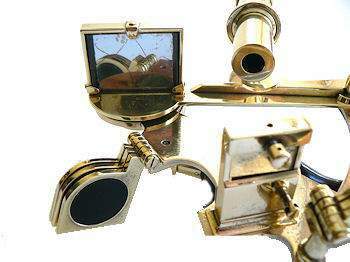 Note the thumb screw on the endless tangent screw, swing arm magnifier, early form platinum vernier scale, reading from right to left from 0 to 20 arc minutes, a removable sighting tube, and two sets of sun shades, three for the index mirror and three for the horizon mirror. The handle is made from Ebony which with the other indicators all of which help date the instrument as from the last quarter of 19th Century.